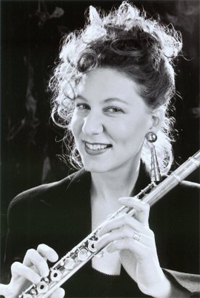 Flutist Camilla Hoitenga brings her eclectic repertoire and charismatic performances with her wherever she goes, to Berlin or New York, the Kremlin in Moscow or the Forbidden City in Beijing. Whether accompanied by orchestras such as the Chicago Symphony or the London Philharmonic, or playing alone on stage, Camilla captivates her audiences by her intense performances, acclaimed by the press as "brilliant", "alluring" and "ideally transparent and precise". Her recordings, in particular those with Kaija Saariaho, have won awards in France, Great Britain and in North America. Inspired by traditional Japanese music, she has been a frequent guest in Japan and has premiered numerous pieces written for her by Japanese composers such as Takehito Shimazu, Miyuki Ito and most recently Yasutaki Inamori. Her repertoire ranges from Bach and Schubert to concertos written for her by Kaija Saariaho, Pèter Koeszeghy or Ken-Ichiro Kobayashi; from Stockhausen's theatrical Zungenspitzentanz for piccolo to Jean-Baptiste Barrière's state-of-the-art pieces for live video and electronics to improvisations and recitals with pianist and sound-artist Taavi Kerikmäe. Camilla is especially inspired by working with composers and artists. In addition to her intensive collaborations with Saariaho and Stockhausen, a wide range of composers including Anne LeBaron, Oliver Schneller, Helena Tulve, Christopher Fox and Donnacha Dennehy have dedicated pieces to her. Commissions for her own music and improvisations have come from painters and sculptors (e.g. Mutsumi Okada, Jörg Immendorf) as well as from galleries and museums. Appreciative of her own flute teachers Darlene Dugan, Alexander Murray, Peter Lloyd and Marcel Moyse, Camilla Hoitenga herself is also a passionate teacher, regularly giving masterclasses and lessons. Born in Grand Rapids, Michigan, she lives in Cologne, Germany and Sylva, North Carolina.